Guests from all over the Washington D.C. Metro Area were welcomed with breakfast as they enjoyed a fun, energetic, and informative presentation highlighting the role of hydraulics in infrastructure resiliency from very special guest speaker, Jerry DiMaggio P.E. D.GE. Although a hard act to follow, Maccaferri’s own Paolo Di Pietro, and Sachin Mandavkar, P.E. M.ASCE followed with compelling presentations of their own highlighting hydraulic works, and soil bioengineering techniques, respectively. 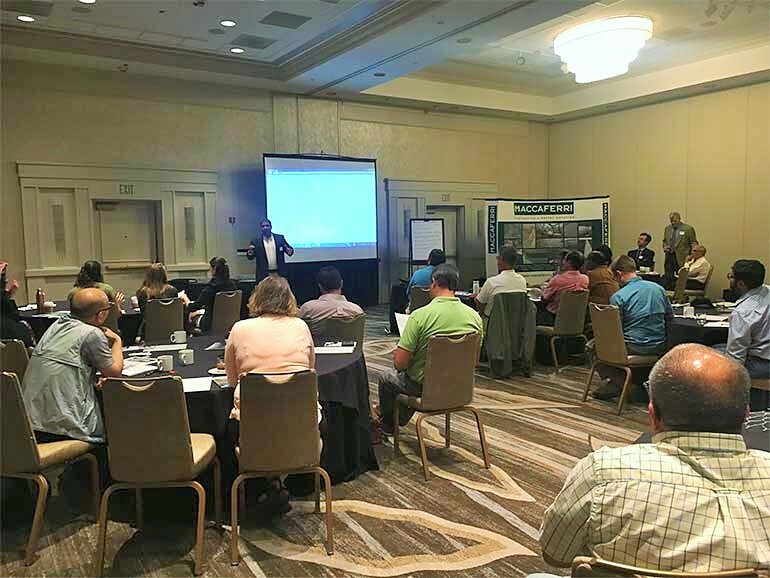 By the close, attendees were thoroughly entertained and equipped with the knowledge to apply hydraulic solutions to their own potential projects. Guests arrived one-by-one and helped themselves to a breakfast buffet just before settling in for the first, and very special guest speaker, Jerry DiMaggio. Attendees were given a brief overview of hydraulic works by Marco Isola, PhD, PE, Senior Engineer with Maccaferri. Marco gave an engaging presentation that included a couple of “did you know?” questions and facilitated dialogue that set the tone for main event scheduled to follow. DiMaggio, principal civil engineer at Applied Research Associates, Inc. (ARA) and industry legend, was up next and began his speech highlighting his impressive career that included over 40 years of experience in civil and transportation engineering, consulting over 1,000 civil construction and business-related projects internationally, and authoring numerous papers. Soon after, guests were enjoying a good-humored, yet informative presentation highlighting the role of hydraulics in infrastructure resiliency. It was clear that attendees were intrigued, as they sat in awe and observed slide after slide of intricate photos that drove each point home. The key take-away of Jerry’s presentation was that the details, arguably more than anything else, do matter. After a short break filled with mingling and networking, attendees were introduced to Maccaferri’s own expert, Paolo Di Pietro, who serves as the senior corporate specialist on hydraulics at Maccaferri in Italy. “It has been said that you must learn the history of a product before you can attempt to put it to good use.” And that is just how Pietro began his compelling presentation. With some of the most antique photographs from the 1800’s and early 1900’s, DiPietro illustrated the gradual change in longitudinal works and grade control structures. By comparing these structures to those utilized in the present-day, attendees got a rare glimpse into the most fundamental functions of the systems they use every day. That made for a graceful transition into learning about environmental issues that can be alleviated using hydraulic solutions. Sachin Mandavkar, P.E., the technical manager at Maccaferri, rounded out the day’s event. At Maccaferri, we believe there is nothing more unpredictable than the environment, yet, there is nothing that needs to be protected quite as much. Mandavkar ensured that guests left equipped with the knowledge to become a part of the solution and that those solutions involve the use of soil bioengineering. Attendees observed several research examples and gained a better understanding of the impact of these solutions. Following the presentations, guests stayed around to ask the questions relevant to their own projects. Equipped with enough knowledge to change their perception of the use of gabions and soil bioengineering in hydraulic applications, attendees filled out brief surveys, and were on their way. Missed the hydraulic solutions seminar? Don’t worry, we’ve got you covered! You can learn more about our solutions during a private technical session in your office. Contact us to schedule a lunch & learn with us.